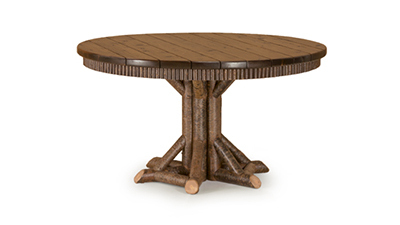 Posted June 22, 2016 by La Lune Collection & filed under About La Lune Collection, Interior Design, Rustic Furniture, Rustic Tables. 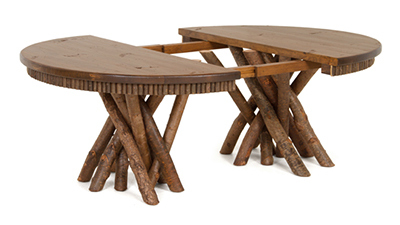 It’s true – La Lune Collection is no stranger to custom furniture design requests. In fact, approximately one-half of La Lune’s production is custom in one way or another. Our furniture is completely bench-made by our own expert artisans in our small Wisconsin factory, and is available in custom dimensions, designs, finishes, and options. 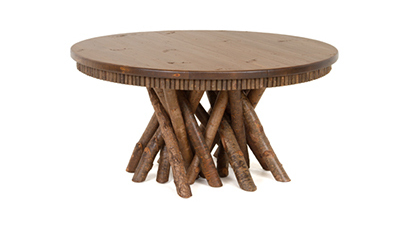 A recurring request that we receive at La Lune is for dining tables that are “made to grow” – in other words, for one of our beautiful rustic dining tables custom-designed with optional leaves which, when added, enable the table to lengthen and welcome additional friends and family members. Just recently we completed two of these custom dining tables “made to grow”, both accommodating from six guests to seating eight or ten guests. We think they turned out beautifully, and we’re pleased to share photos of them here! 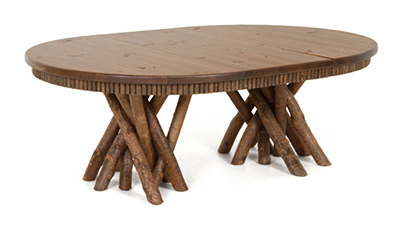 This finely crafted table was planned with the added design feature of a precise “apron” of poplar branches, and with a cedar plank top, the latter addition making it suitable for use outdoors under cover as well as indoors. In its “closed state” it comfortably accommodates six people. With the addition of extension leaves the table seats eight to ten guests. 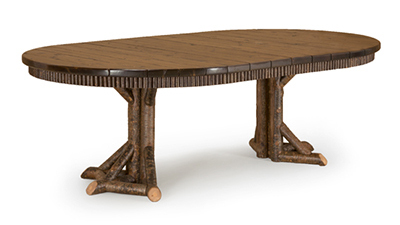 This table’s gracefully organic base of free-form branches presented La Lune Collection’s designers with an exciting design challenge when the request for extension leaves was made. We – and the happy clients – think that the result was a resounding success. 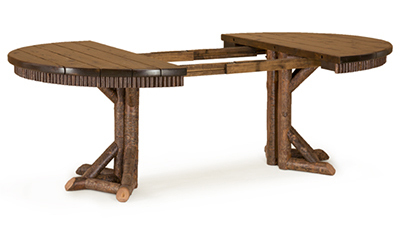 The table, which normally can handle six guests, now makes it possible for eight or ten people to join in the fun when the leaves are added. At La Lune Collection we truly love creating beautiful custom furniture designs of all kinds, including not only tables, but also seating, beds, accessories and more. Almost anything in our line can be crafted to specifications, in custom dimensions, designs, finishes, and options – and we can even create furniture made to your very own design. Just tell us what you have in mind, and one of our designers will be thrilled to discuss your project, create a quote, and generate a drawing for your approval!